A talented field of eight runners is set to compete in the rescheduled $100,000 Interborough for fillies and mares 4-years-old and up going seven furlongs at Aqueduct Racetrack on Friday. The Interborough's 98th running was initially slated to be run on the Monday, Martin Luther King, Jr. holiday card, canceled due to dangerously low wind chill values forecast in the New York city metropolitan area. Chad Brown will saddle Your Love, a 5-year-old daughter of Flatter, for owner Paul Pompa, Jr. The ultra-consistent bay, who boasts a record of four wins and four seconds from 10 starts, will look to rebound off a fifth-place finish here in the Go For Wand (G3) on Dec. 1. 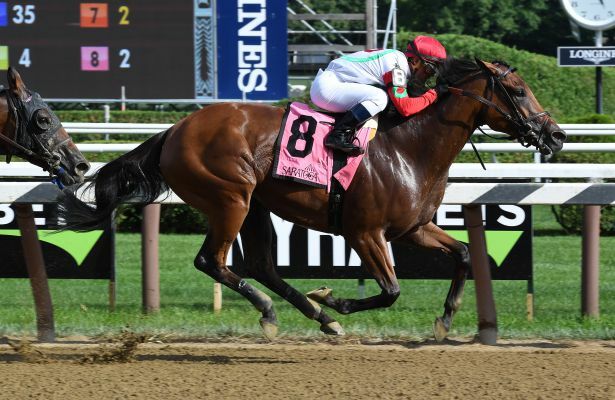 Your Love has demonstrated an affinity for sprinting seven furlongs with a victory in the Shine Again on Aug. 1 at Saratoga Race Course and a second-place finish in the Safely Kept on Nov. 11, 2017 at Laurel Park. With Manny Franco aboard, Your Love will depart from post 8. Winter meet leading trainer Linda Rice will send out Sower for owner Leonard Green and Honor Way for Aron Yagoda. Sower, a 4-year-old daughter of Flatter, had a productive 2018 campaign in which she won four races from nine starts with three third-place finishes. With one win at the seven-furlong distance in the Pumpkin Pie on Oct. 28 at Belmont, Sower will look to improve off a fourth-place effort in the Thirty Eight Go Go on Dec. 29 at Laurel. In her final workout heading into the race, Sower breezed five furlongs in 1:00.69, good for fifth among 23 horses at the distance on Saturday at Belmont. "The rescheduling of the race actually kind of helped us out a little bit," said Rice. "It gave us a little more time to get her ready and get in a maintenance breeze with her yesterday which I thought went well. Getting back to run at the seven-eighths distance should help her, and we're excited to run her." Honor Way will look to earn her first win since capturing an allowance race in October at Keeneland. A 5-year-old daughter of Caleb's Posse, Honor Way has since picked up a third-place finish in an allowance race at Churchill and a fourth-place finish on Dec. 13 at Fair Grounds, while competing in optional claiming events. Sower will leave from post 3 with Jose Lezcano aboard. Honor Way will be ridden by Eric Cancel from post 6. Ivan Dalos' homebred Silent Sonet was transferred to conditioner Tom Morley following the end of the 2018 season at Woodbine. The graded stakes winning daughter of Silent Name has made all 13 of her career starts at Woodbine, with stakes wins on both turf and synthetic surfaces. In her most recent start, she finished second in the Bessarabian (G2) on Nov. 25. "She's an extremely classy horse," said Morley. "She arrived from trainer Nick Gonzalez in great shape. We haven't asked her to do much in the mornings, which is by design. We know she's fast and the idea is to see how she will run on the dirt. It's a possibility she may stay with us a little while longer through the spring depending on how she takes to the surface." Silent Sonet will depart from the inside post with Chris DeCarlo up. Also entered is multiple stakes winner Yorkiepoo Princess, who took the Autumn Days here on Nov. 25 for trainer Eddie Barker and owner Danny Chen; Dawn the Destroyer for trainer Kiaran McLaughlin and Stonestreet Stables; Short Kakes for Two Tone Farms and trainer David Cannizzo; and Miss Mimosa for Cheyenne Stables and Hall of Fame trainer Bill Mott. The Interborough is slated as Race 8 on Friday's nine-race card. First post time is 12:25 p.m. ET.